Technicolor’s President of Worldwide Post Production Sherri Potter and Technicolor’s award-winning VP of Theatrical Imaging & Supervising Finishing Artist Steve Scott discuss the role and implication of the technology on the creative process. After working on high-profile HDR projects, what are the challenges, opportunities and future of color finishing in HDR. HBO’s groundbreaking technology documentary series Image Study seeks to demystify common misconceptions about creative technologies. This season we explore everything that goes into creating High Dynamic Range content we test and compare cameras, lighting, monitors and more. From production to post come along with us as we learn all we can about creating High Dynamic Range content. Lukas Colombo is a multi-award winning film director and cinematographer with a strong passion for his craft. Raised in Santiago, Chile. He studied Cinema and Television at Palm Beach Atlantic University where he was honored as the “Outstanding Graduate in Entertainment Media.” That same year, he founded Moai Films, a production company that has produced numerous projects from commercials and music videos to narrative films and documentaries. He has received over a dozen international and national awards for his narrative work, and his music videos have been viewed millions of times online via MTV, VEVO and VH1. His feature film debut premiered at LA Live Regal Cinema’s Premiere House in Los Angeles, California in 2014. His numerous short films continue to collect awards and festival selections around the world. A discussion around the current state of HDR on-set through its pipeline and implications throughout a production. 1:15 But will the audience see it? The major studios have both a business and creative motivation to provide theater-goers with the most compelling content possible. HDR will play an increasingly important role in advancing image quality. In this panel, you’ll hear directly from studio representatives, and the people on their team about what is working, and what more needs to be done in support of the HDR pipeline. Producing and grading HDR for television release has its own set of challenges. This panel will explore the process and workflows that have been pioneered by Netflix and others to meet the schedule, budget and creative challenges. Unwind after the Summit with Music & Drinks. Brought to you by Cinionic and Blackmagic Design. 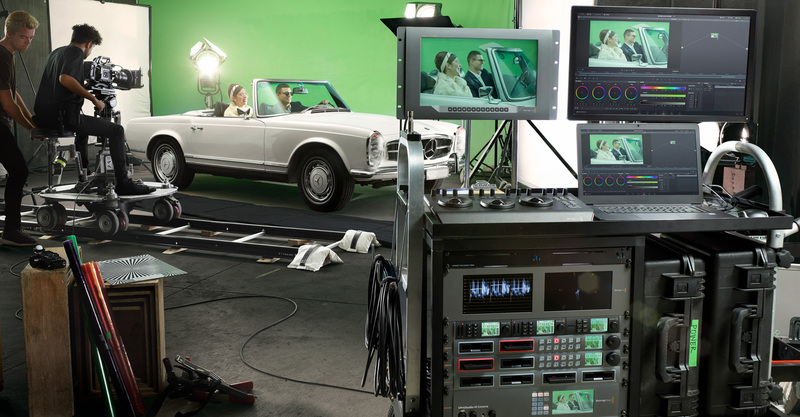 Attendees will have the opportunity to move around a sound stage with live sets that will demonstrate the contrast between SDR and HDR Shooting, Post-Production, Colorization and other pipeline processes. The demonstrations will be open throughout the day for guests to explore. Blackmagic Design will be showcasing it’s latest URSA Mini Pro 4.6K camera for HDR production, along with DaVinci Resolve Studio for editing, grading, and finishing HDR content. You’ll be able to get hands on shooting on set with the URSA Mini Pro alongside DP and Cinematographer Lukas Colombo who has shot and finished several HDR projects with the camera. You’ll also see DaVinci Resolve in action and have an opportunity to speak with an HDR colorist and product specialist about DaVinci Resolve, so you can learn how it fits into your HDR and SDR workflows. Cinionic will be demonstrating the prototype of a new high contrast HDR laser projector with “light steering” technology that effectively throws more light at parts of the image that require high brightness, but not the darker areas. This reduces the use of heat — and therefore cost — because you don’t need as much light. Because light is not wasted, this opens up the promise of HDR for the masses at a ‘normal’ price point in the future. Sony has always led the way in 4K/HDR for scripted and live production. At the HDR Summit, Sony will present a live, visual experience demonstrating the true power of HDR. This unique presentation will be displayed on the industry-standard BVM-X300 monitors. In addition, Sony will demonstrate end-to-end production workflows with the VENICE Full-Frame Cinema Camera and the latest post tools from FilmLight. Dolby will have a 30 minute in-depth overview of the full Dolby Vision HDR Color Grading tools and workflow with colorist Greg Hamlin ( HDR Vision grades for Mad Max Fury Road, Platoon, Tarzan, Logan Lucky, Argo) and Dolby Representatives Tom Graham & Aby Matthew. Learn how you can create the HDR and Wide Color Gamut master image, as well as the Dolby Vision, HDR 10 and Rec 709 SDR deliverables. ARRI will show the difference between SDR and HDR in a controlled environment, demonstrate HDR monitoring on set in conjunction with in-camera LUT support for HDR. The experience will be very educational and exhibit practical examples of strobing/stutter effect when moving the camera and other “gotcha” situations experienced when shooting HDR. Explore the exhibition floor to see new technology, software and content from Black Magic Design, Netflix, Technicolor, Cannon, Sony and AJA. Stage two exhibitions will be open throughout the day. We wish to acknowledge the support of Chairman Curtis Clark and the ASC Motion Imaging Council for making this event possible. Our sincerest appreciation to the Society’s HDR Working Group for spearheading the event. Mike Zink – Warner Bros.
Hanno Basse – 20th Century Fox Film Corp.